Christmas is coming, didn't you know?! Every year I do a whip round of the local hotels (and some further afield) to see what they've got planned for Christmas and NYE so you can have a one stop spot to see whats what for this coming festive season. 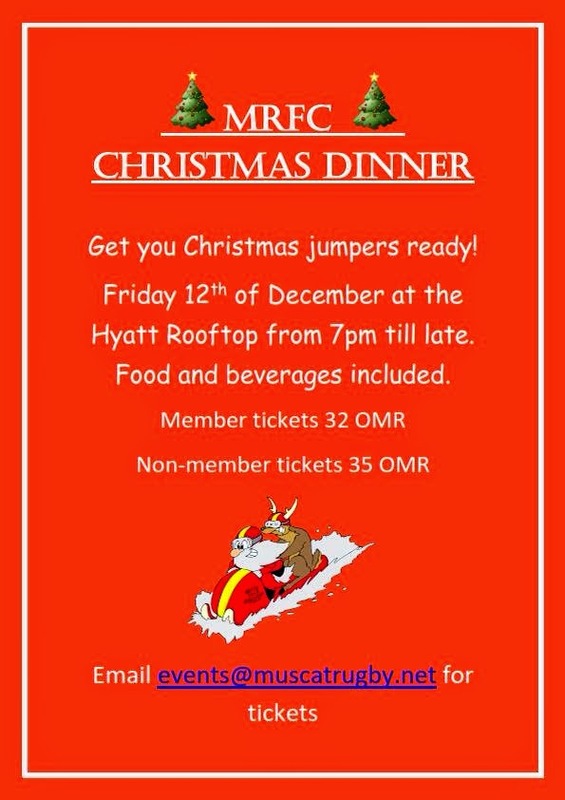 On December 12th at 7pm the Safari rooftop grill are hosting the MRFC Christmas dinner, anyone who went to the Halloween party last month will know the kind of crowd that attends the MRFC parties. The theme this time is rubbish Christmas jumpers - tickets are RO 32 for members or RO 35 for non-members. Includes all you can eat and drink and to get tickets email events@muscatrugby.net. Tuscany - RO 42 (Kids RO 21) for a 4 course set menu with an Italian theme with a glass of sparkling wine between 7-11pm. Club Safari - RO 5 cover charge - business as normal till 3am! Safari Rooftop Grill - RO 31 for Seafood or poultry (eg turkey), RO 39 for Mulwarra steaks, seafood platter or surf and turf or RO 43 for Canadian beef, angus beef, wagyu steaks or seafood. Mokha Cafe - RO 39 (Kids RO 19) for Christmas day brunch with a glass of sparking wine, DJ providing entertainment and a visit from Santa too. Open 12:30pm till 3:30pm. Tuscany - A traditional Italian Christmas day lunch by Chef Mauro Ferrari is available ala carte, between 12:30 and 3:30pm. Grand Burlesque Gala ball - RO 85 (rises to RO 95 after December 15th) (Kids RO 40) for a burlesque show with live acrobatic fire, aerial show and s stilt walker flown in especially for this party. Runs from 8pm till 2am. Tuscany - RO 80 (Kids RO 40) for a 6 course Italian black tie dinner from 8pm till 2am. Safari Rooftop Grill - RO 60 (Kids RO 30) for a set menu with full open bar from 7:30pm till 1:00am. Club Safari - RO 15 including a signature cocktail, from 6pm until 3am. Copacabana - RO 10 including a signature cocktail, from 10pm til 3am. Camp Hyatt - For the kids, a complimentary babysitting and snack service to allow you to enjoy your NYE party - open from 7pm till midnight. 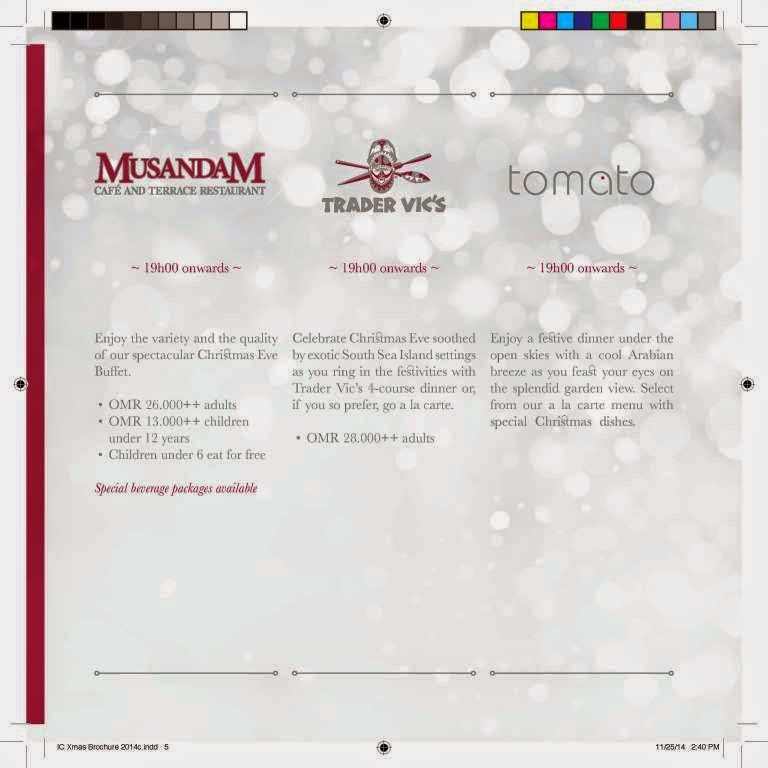 Musandam - RO 26++ (RO 13++ for kids 6-12) for Christmas buffet dinner from 7pm. There are special beverage packages available for RO 8++ which is unlimited selected beverages. 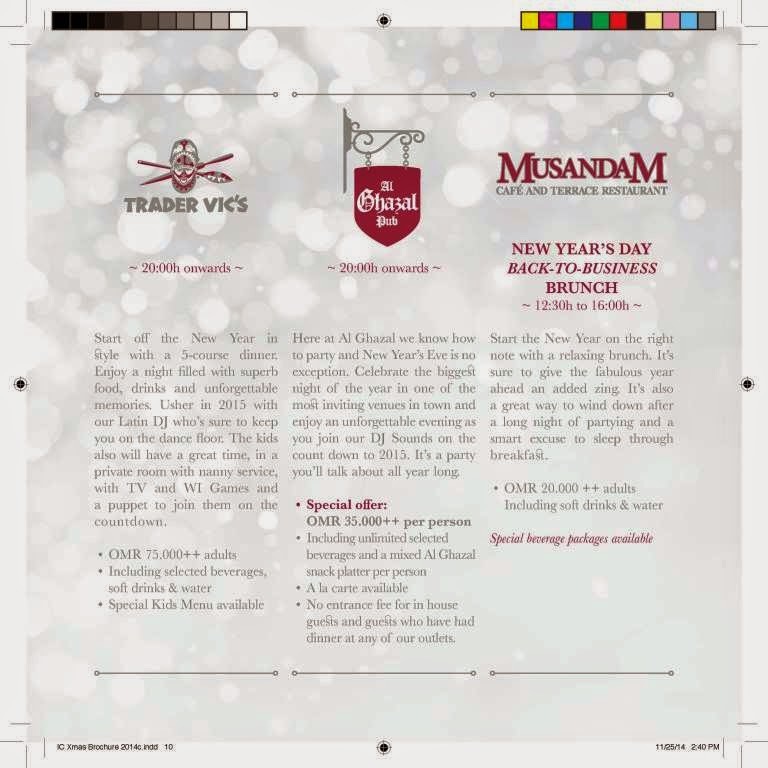 Trader Vic's - RO 28++ for a 4 course dinner, or you can go a la carte, open from 7pm. Tomato - Their usual menu along with special Christmas dishes are available, a la carte, from 7pm. 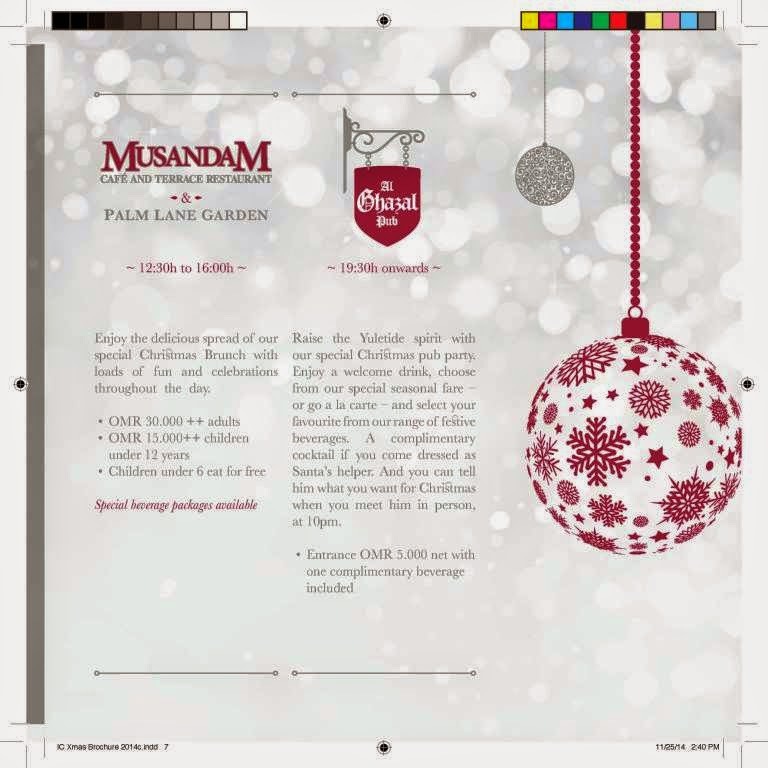 Musandam Cafe & Palm Lane Garden - RO 30++ (RO 15++ for kids 6-12) Special Christmas brunch from 12:30 till 4pm with a visit from Santa and kids activities. There are special beverage packages available for RO 8++ which is unlimited selected beverages. Al Ghazal Pub - RO 5 entry with a complimentary drink, and you get an additional complimentary cocktail if you come dressed as Santa's helper - and Santa will be visiting at 10pm. Doors open at 7:30pm. Le Caprice - RO 85++ for a 6 course dinner paired with the perfect wine created by Chef Pascal, pre-dinner cocktails at 8pm, dinner at 8:30pm. Musandam Cafe & Palm Lane Garden - RO 65++ (RO 28++ for kids under 12) Disco fever with 70's and 80's tunes all night long with a large buffet and free flow of selected drinks from 8pm. 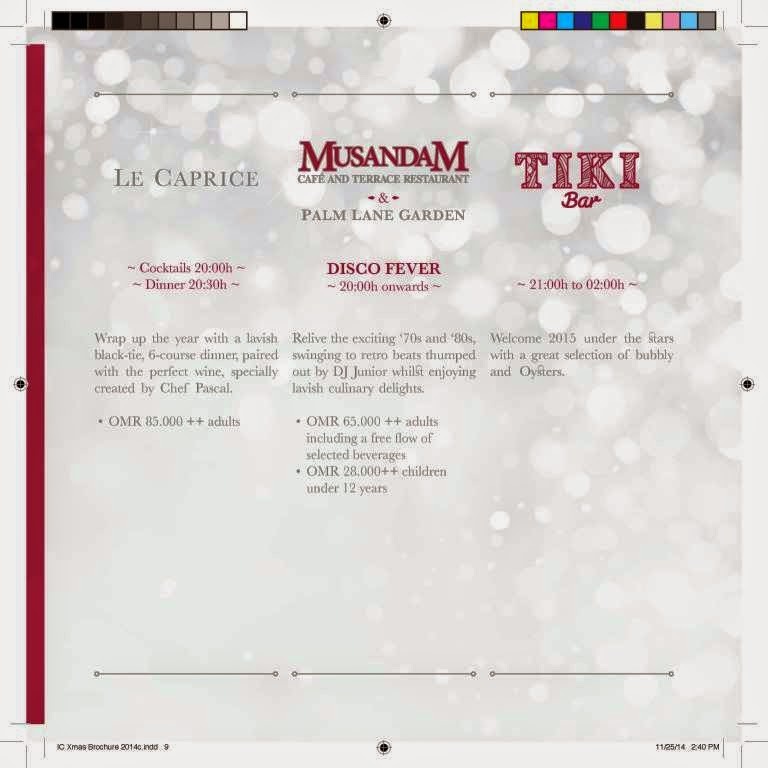 Tiki Bar - From 9pm until 2am, welcome in the new year with a selection of bubbly and Oysters - a la carte. Trader Vics - RO 75++ including selected beverages - 5 course dinner with a Latin DJ to keep you moving on the dance floor. There's a special private room for the kids with a nanny service too. Al Ghazal - RO 35++ including selected beverages - Get your drink on at this party from 8pm - RO 35 plus the taxes for all your drinks and finger foods. If you have had dinner at any of the other outlets in the hotel that night, entry to this party is complimentary. Christmas Eve - Full dinner at The Restaurant - RO 60++ per person. 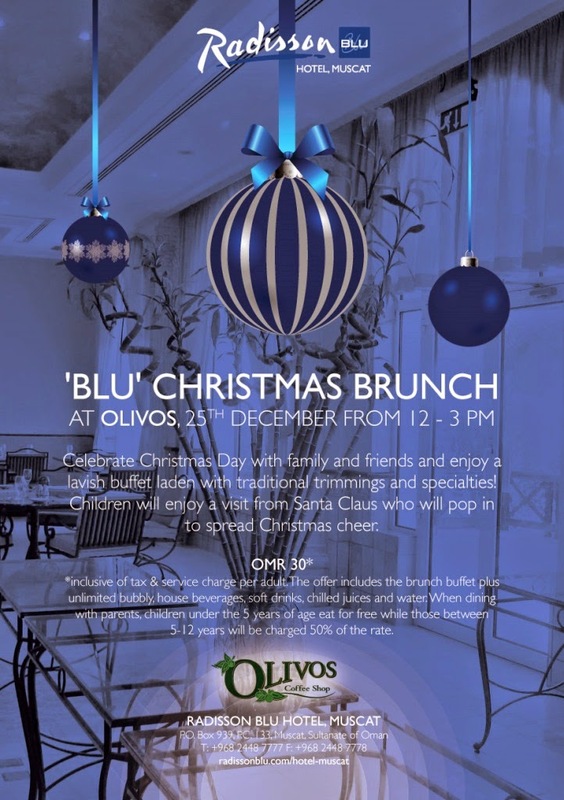 Christmas Day - A superb brunch with dishes from their 4 open show-kitchens serving Middle Eastern, Western, Indian & Asian cuisine at The Restaurant - RO 45++ per person. The Restaurant - RO 98++ Lavish Gala buffet dinner with after party DJ. The Beach Restaurant - RO 98++ 6 course countdown dinner menu with a sea food theme with soft instrumental music followed by the after party DJ. Boxing day fun run - run off that turkey around the resort, starts at 8am. Capri Court - RO 35 5 course Italian themed Christmas Dinner (Kids are RO 11). Bait al Bahr - RO 35 (Kids RO 11) for a sumptuous 5 course seafood meal. Sultanah - RO 50 - 6 course menu with live music from house jazz band. Father Christmas will be visiting little guests in the Dhow area by the Marina between 3 and 4:30pm. Al Tanoor - LUNCH RO 18 (Traditional buffet) DINNER RO 20 - also buffet dinner. Add RO 10 for unlimited house wines, beers, soft drinks and juices. 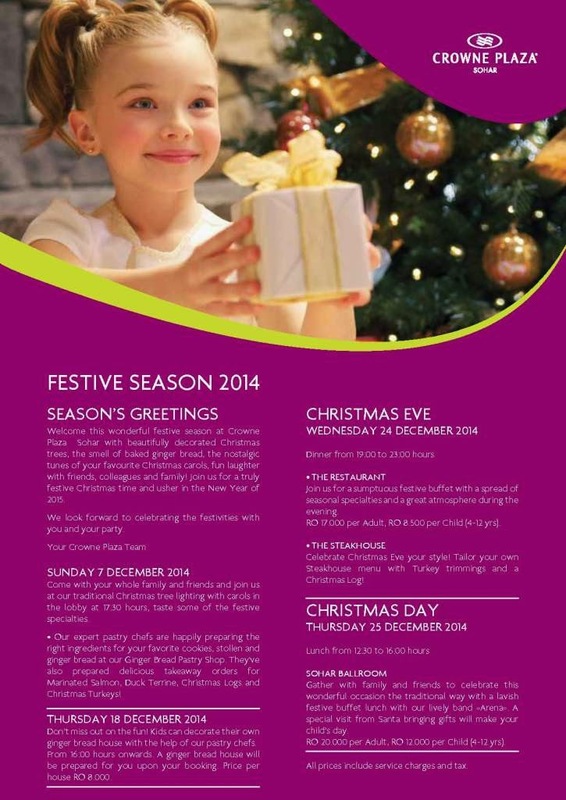 Bait al Bahr - RO 25 (RO 9 for kids) for 4 course Christmas dinner from seafood. Capri Court - RO 25 (RO 9 for kids) for 4 course Italian themed Christmas dinner. Sultanah - RO 59 - BBQ buffet with unlimited bubbly and selected beverages with live music from the jazz band. Shahrazad - RO 35 - Moroccan themed 5 course feast with live Moroccan entertainment. Dinner at any of these restaurants: Al Tanoor, Tapas & Sablah or Fairouz. Followed by access to the Turtle beach countdown party (10pm-2am) and access to the after party in the Shangri-la ball room (1am-3am). Room rates are available, and all of the above is complimentary to the room rate, which you can get by calling the hotel on 2477 6565 to enquire about. 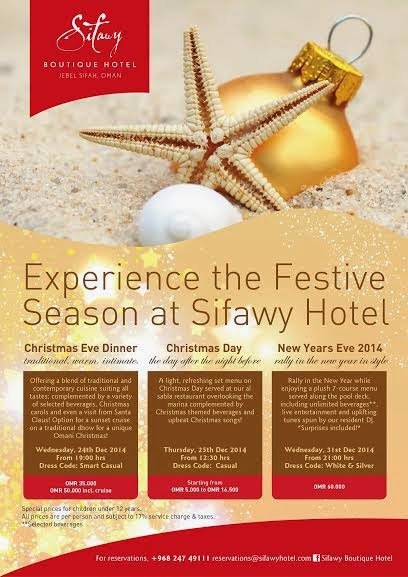 Christmas Eve - RO 35++ per person, or RO 50++ inclusive of a Dhow cruise (Kids RO 12++ / RO 25++). Unlimited selected beverages, starting from 7pm and includes a visit from Santa and carol singing. Christmas Day - RO 5++ to RO 16.5++ per person, depending on what you have. Set menu in Al Sabla restaurant overlooking the marina. New Years Eve - RO 60 per person. White & Silver themed 7-course dinner served outside on the pool deck. Live entertainment and unlimited selected beverages. Al Khiran Terrace - RO 34 Dry, or RO 55 including bubbly, wine or beer. 12:30 till 3:30pm, traditional Christmas dinner and seafood too. Santa will be visiting the kids (RO 17 per head for kids). Beach Pavilion - RO 59 including a glass of bubbly. From 7pm - 5 course menu setting at the waters edge. China Mood - RO 59 including a glass of bubbly. From 7pm - 5 course menu served with speciality teas prepared by their tea sommelier! Al Khiran Terrace - RO 39 soft drinks, RO 59 with bubbly, wine or beer (kids for RO 17) - luxury buffet dinner. Black & Gold party on the beach - The premier NYE event from the Bustan Palace this year, from 8pm. RO 99 for guests staying in the hotel, or RO 120 if not - open bar for selected drinks. Christmas Day - RO 30 per person (kids 5-12 are 50% off) for a Classic Christmas buffet with all the trimmings and a visit from Santa for the kids. Includes unlimited house beverages and bubbly. 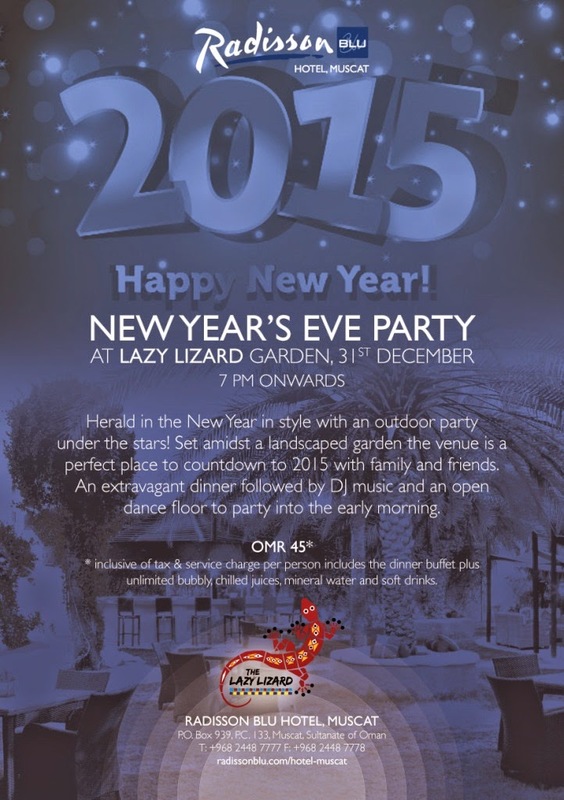 New Years Eve - RO 45 per person in the Lazy Lizard garden with an "extravagant dinner" and DJ to dance the night away. Unlimited bubbly, chilled juices & soft drinks (I think beer is extra). Tropicana - RO 38 (Kids RO 17.5) for a buffet dinner. Come Prima - RO 35 Italian 5 course set menu dinner. The Edge - RO 35 four course set menu dinner with perhaps the best view for a restaurant in Muscat. Tropicana & The Edge - RO 50 (kids RO 25) Gala buffet dinner with live music to dance the night away. Includes drinks. Come Prima - RO 50 for a 5 course set menu Italian themed including drinks. Shiraz - RO 50 for a Persian themed 5 course menu with drinks. Christmas Eve - RO 30 for dinner at the RBG before going upstairs to the Sama Terrazza to party the night away. One lucky guest might win tickets from Thai Airways. RBG - RO 40 for dinner at RBG including a half bottle of wine and complimentary access to the Sama Terrazza, and also name in the draw to win tickets from Thai Airways. Sama Terrazza - RO 20 for entry to the rooftop bar which includes a complimentary drink. Goes from 7pm till 2am. New Years Eve - Axis Events are throwing a NYE party at ODC this December 31st, there is a facebook event page here, and tickets are RO 15 including 1 complimentary drink. Runs 8pm till 3am. New Years Eve - RO 40 for buffet dinner and open bar, live band and DJ providing entertainment, club members get a 10% discount. New Years Eve - RO10 entry with 2 drinks, RO 40 entry with dinner and 2 drinks or RO 65 entry dinner and free-flow of drinks all night. 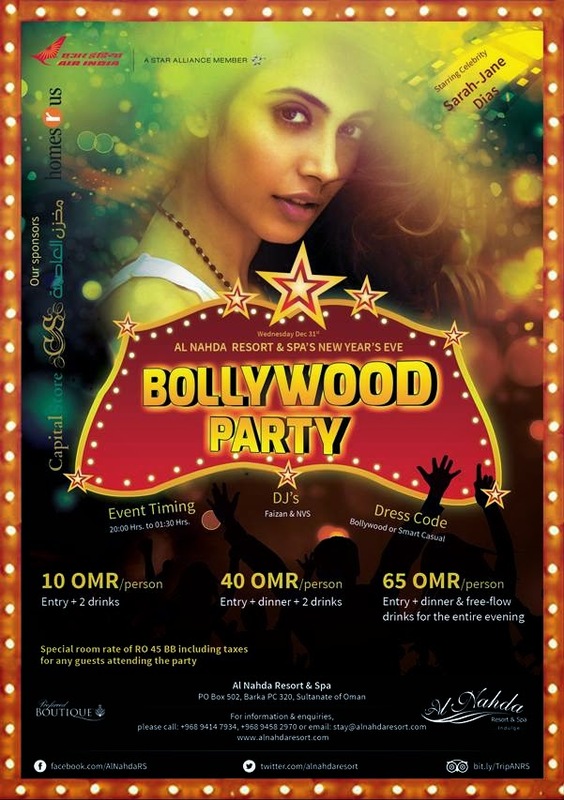 Bollywood party from 8pm till 1:30am. Special room rate of RO 45 including breakfast for Dec 31st. Christmas Eve - RO 35 (kids half price) for buffet dinner and a glass of mulled wine or fresh juice. Christmas Day - RO 35 (kids half price) for buffet lunch and a glass of mulled wine or fresh juice. New Years Eve - RO 35 or RO 45 (for alcohol included) outside dinner on the beach with live entertainment. If you come late, it's only RO 25 (alcohol included) after 10:30pm. If you want to book a room its RO 140 for the room, party (soft drinks only) and breakfast the next day, or RO 160 if you want booze, a sea-view is available for an additional tenner. Christmas tree lighting - Sunday 7th December at 17:30 with carols and "festive specialities" = mince pies. Ginger bread house for the kids - Thursday 18th December from 16:00 onwards - RO 8 per house. The Restaurant - RO 17 per adult (RO 8.5 for kids 4-12yrs) for a festive buffet. From 19:00 - 23:00. The Steakhouse - a la carte menu with Turkey and Christmas log on offer. From 19:00 - 23:00. Sohar Ballroom - RO 20 per adult (RO 12 for kids 4012yrs) for Christmas buffet lunch with a visit from Santa with gifts for the kids. In the garden - RO 45 per adult, RO 90 per couple. 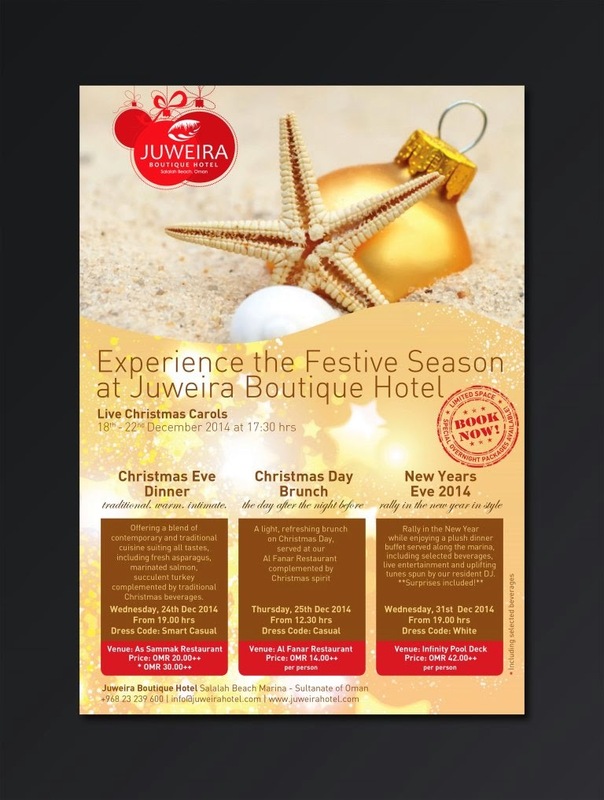 Gala dinner buffet with drinks inclusive and live entertainment. 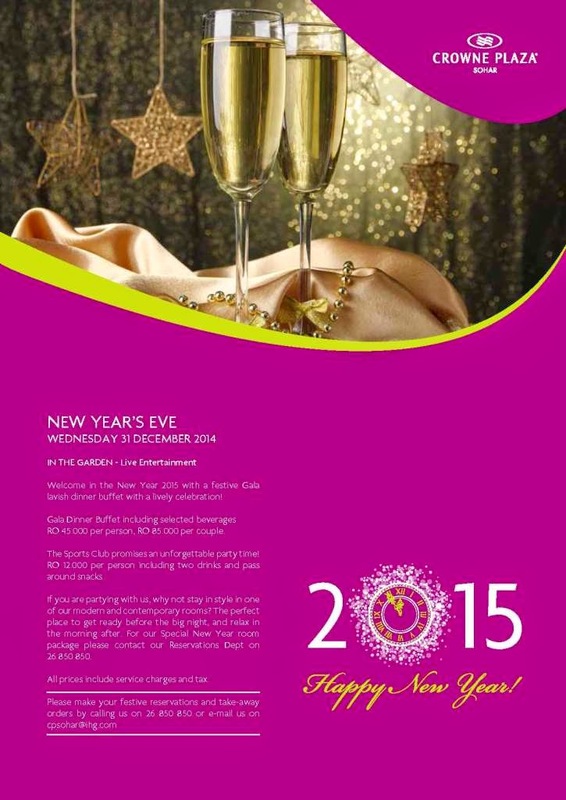 Special room rates for NYE available, call 2685 0850 or email cpsohar@ihg.com for more information. The Sports Club - RO 12 per person, 2 complimentary drinks and pass-around snacks. Christmas Eve - Pool lawn dinner, RO 25 traditional Christmas dinner. Special room packages for NYE available - RO 85++ with breakfast included. Christmas Tree lighting ceremony on 20 December at 7pm, the St. Francis Xavier Catholic Church Choir and The International Nursery school will lead the ceremony with carol singing. 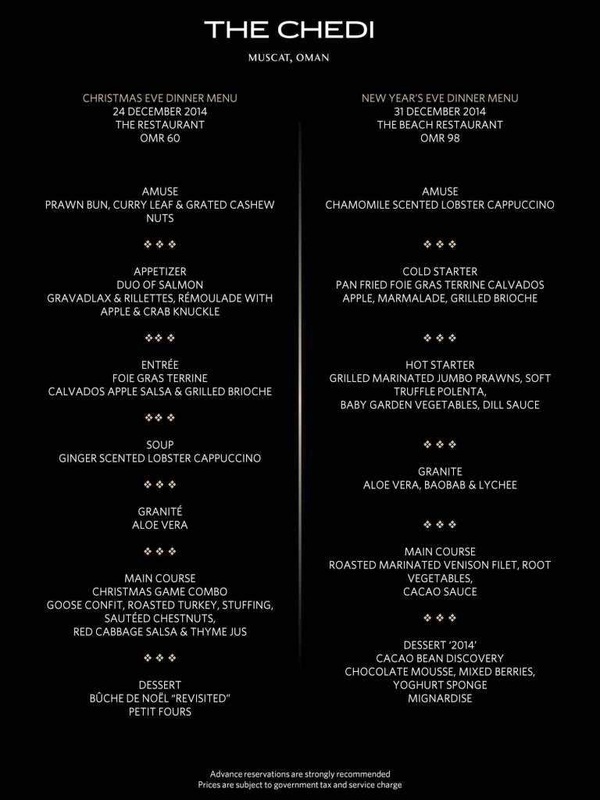 Christmas Eve - RO 30++ 4 course set menu, kids under 5 are free, between 5 and 12 dine 50% off. Alcohol not included. New Years Eve - RO 65++ 5 course set menu, kids under 5 are free, between 5 and 12 dine 50% off. Alcohol not included. Christmas Eve - RO 20 / 30 ++ at the As Sammak restaurant from 7pm. Traditional Christmas dinner with a fishy twist - complemented by traditional Christmas beverages. New Years Eve - RO 44++ From 7pm - White themed NYE Gala buffet along the marina with selected beverages and live entertainment. 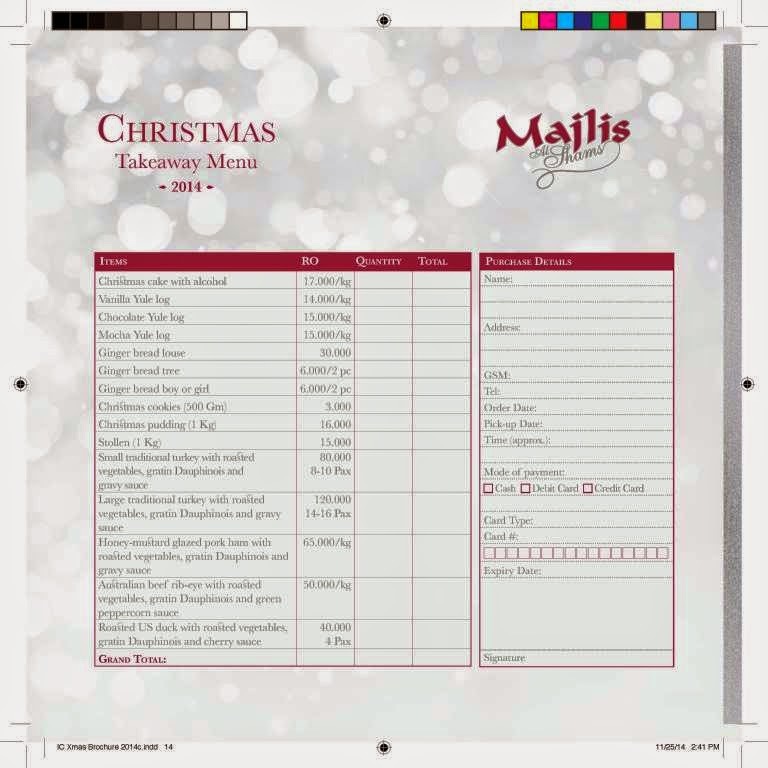 Christmas takeaway menu is available from December 15th until January 3rd. Orders can be placed on 2464 1234 and need to be placed 48hrs in advance. Christmas Pudding - RO 60 - comes with brandy butter, 6 mince pies assorted cookies and pralines. Suits 6-8 people. Order from Majlis al Shams in the lobby, they need 24hrs notice and are open between 8am and 10pm. If you have an event and want it to be included in this listing, its free! just drop me an email on mrsythe@gmail.com with your details and I'll update the listing! Wow, had no idea there's going to be so much happening in town! Great write up, very informative. Thank you! After getting engaged and looking at countless venues in the city, we stumbled upon the website for this place. And these guys at Boston restaurants really worked endlessly to ensure my happiness.